At this page we will discuss about Guide to Apply FPSC Online Step by Step for any Posts 2019 for All Candidates. As we all know that Federal Public Service Commission FPSC is an organization which is working for recruit civilians in Government Department working under Federal Government and it announces many jobs every weekend. 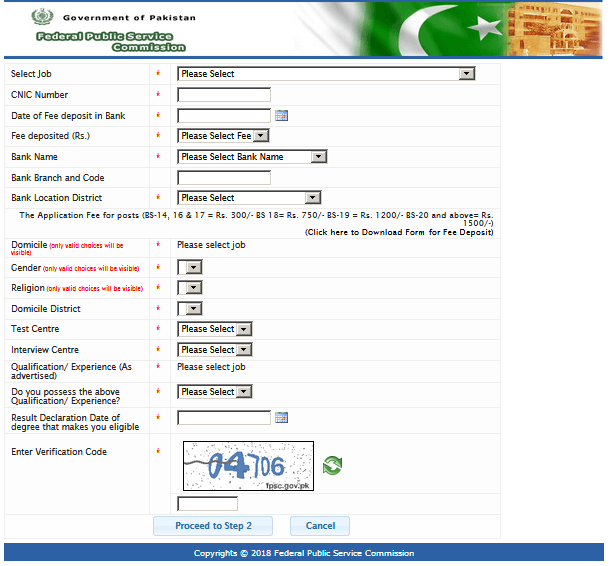 The basic problem is that most of applicants don’t know about how to apply for Jobs at FPSC official site. Don’t worry we solved this problem of How to apply online at Federal Public Service Commission. In this page we discuss the complete guide line of apply on FPSC step by step. It is in the interest of the applicants to study and thoroughly observe the guideline given in this page while applying online for any jobs in FPSC. The candidates are also advised to thoroughly study rules for any jobs available on FPSC website and then they apply online for related post. Below we mention the process of online application submission. Applicant click on Apply Online. Select relevant field in which you want to apply. Nest page will be appeared and fill complete carefully. Enter your education related class degree. The end of filling application carefully click on submit application. Then your data appear on your screen. Candidates must print out the application form.